Plain rice may be fine for family and for some specific dals and curries, but when Indians entertain, a more festive version is usually required. 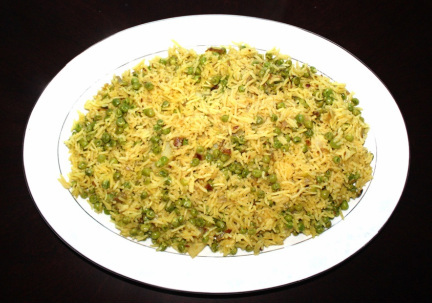 Green pea with rice is one of the most popular simple versions of cooked rice in North India. It is simple to make and great for parties and festive occasions. Lot of variation could be made with using different vegetables and spices. 2. In a sauce pan heat the oil, add chopped onions and sauté them for 5 to 6 minutes on medium high heat or until they become light brown. Add cumin seeds and asafetida and fry for 1 minutes, or until cumin seeds become brown, add bay leaves (if you are going to add cinnamon stick and black cardamoms add now) and fry for few seconds turn the heat to low. minutes, while being careful not to break the rice grains. the rice level then lower the heat to low, and place the cover over saucepan. 5. Let the rice cook on low heat for 5 to 6 minutes then turn the heat off. 7. Fluff the rice gently with a fork before serving. 2. 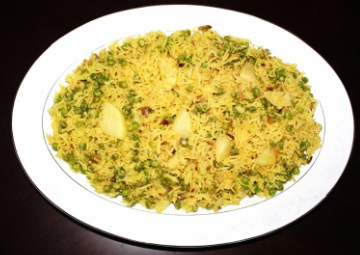 Paneer, potatoes or any other vegetables or spices could be added to the pulao.